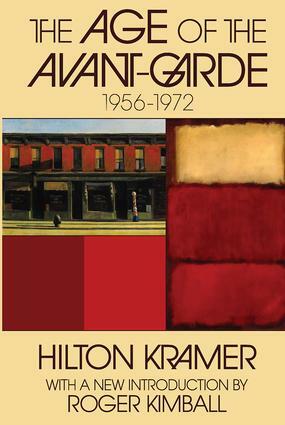 Hilton Kramer, well known as perhaps the most perceptive, courageous, and influential art critic in America, is also the founder and co-editor (with Roger Kimball) of The New Criterion. This comprehensive book collects a sizable selection of his early essays and reviews published in Artforum, Commentary, Arts Magazine, The New York Review of Books, and The Times, and thus constituted his first complete statement about art and the art world. The principal focus is on the artists and movements of the last hundred years: the Age of the Avant-Garde that begins in the nineteenth century with Realism and Impressionism. Most of the major artists of this rich period, from Monet and Degas to Jackson Pollock and Claes Oldenburg, are discussed and often drastically revaluated. A brilliant introductory essay traces the rise and fall of the avant-garde as a historical phenomenon, and examines some of the cultural problems which the collapse of the avant-garde poses for the future of art. In addition, there are chapters on art critics, museums, the relation of avant-garde art to radical politics, and on the growth of photography as a fine art. This collection is not intended to be the last word on one of the greatest as well as one of the most complex periods in the history of the artistic imagination. The essays and reviews gathered here were written in response to particular occasions and for specific deadlines--in the conviction that a start in the arduous task of critical revaluation needed to be made, not because a critical theory prescribed it but because our experience compelled it! Were These Braque’s “Great Years”?